Manufacturer: Dorcy International Inc. of Columbus, Ohio. Hazard: The batteries may overheat, leak, or rupture, presenting a potential for fire and injury. Description: Each of the 3-volt lithium batteries has a white label with the words "Fuji Power" or "A&T Fuji Power CR123A." The batteries were provided separately in pairs in packaging with the flashlights. 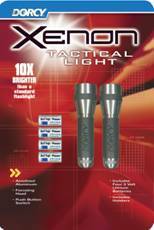 Tactical Xenon Light or the Xenon Tactical Light. Consumers also can return the flashlights to the store for a refund or replacement. Consumer Contact: Call Dorcy International Inc. toll-free at (800) 837- 8558 Monday through Friday, 8:00 a.m. to 5:00 p.m. Eastern Standard Time. Dorcy’s web site is www.dorcy.com. Consumer Product Safety Commission (CPSC) and Dollar Tree Stores, Inc. of Chesapeake, Virginia recall candles. Name of product: Luminessence™ T-Lite Candles with Glass Holder. Manufacturer/Importer: Dollar Tree Stores, Inc., of Chesapeake, Virginia. Hazard: Paint on the exterior surface of the candles can sustain a flame posing a potential fire hazard. 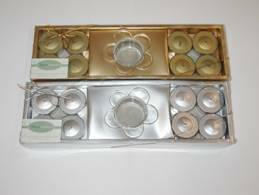 Description: The recalled candles were sold in packages containing eight tea light candles and one glass holder in the shape of a flower. The 1-inch tall candles were available in either gold or silver. A label affixed to the top of the package containing the recalled candles reads "Luminessence™ candles, 8 T-Lite Candles with Glass Holder, NET WT 3.2 oz (EACH 10G)." The label affixed to the bottom of the package reads, "DOLLAR TREE DIST., CHESAPEAKE, VA 23320, MADE IN CHINA." Remedy: Dollar Tree is offering a refund for each returned candle set. Name of product: Fluorescent Light Bathroom Fixtures. Manufacturer: Progress Lighting, of Spartanburg, South Carolina. Hazard: The lamp holders on the fluorescent lights can overheat, causing the fixture to melt or burn, presenting a fire hazard. Description: This recall involves linear light fixtures intended for use in bathrooms. The fixtures were sold in 2-, 3- and 4-foot lengths with a ribbed, plastic lens covering the fluorescent tube. The Progress Lighting catalog numbers are 717430-EBO, 717330-EBO and 717230-EBO. Catalog numbers and manufacturing dates can be found on the UL label located under the plastic lens. Fixtures included in this recall were manufactured from January 1998 through February 2003. Remedy: Consumers should contact Progress Lighting for instructions on receiving a free replacement fixture.